The Bega 77326 LED spotlight with earth spike is an unobtrusive spotlight, which is also labelled as a compact spotlight due to its small dimensions. The company of Bega is known for using only high-quality materials for their products. No exception was made here: the spotlight is made of cast aluminium, aluminium and stainless steel. The reflector of the 77326 is made of anodised ultra-pure aluminium. Furthermore, the earth spike is made of glass fibre reinforced polyamide and the light opening is covered by safety glass. On top of that, the Bega 77326 LED spotlight with earth spike is available with an elegant graphite surface. A turning knob underneath the lamp head allows you to adjust the light direction without any tools. This spotlight uses energy-efficient LED technology. The light of the Bega 77326 spotlight is symmetrical with a half-peak divergence of 46° and an evenly spread light intensity. Where the light of this small outdoor lamp falls, is up to you, as the flexible lamp head may be tilted between -30° and +60°. 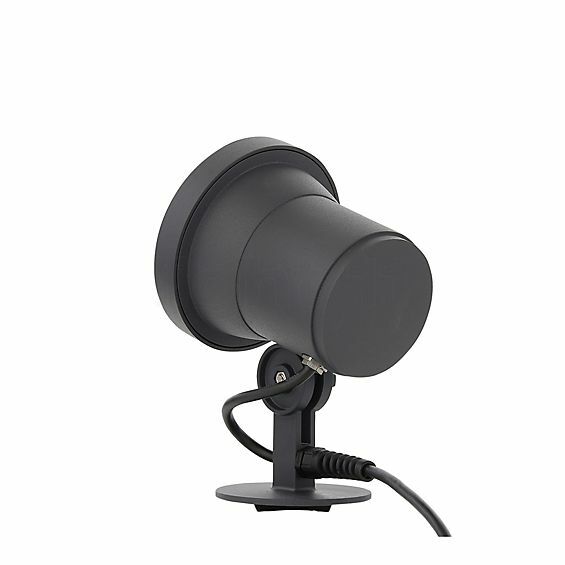 This turns the Bega 77326 LED spotlight into a needs-oriented lighting solution for the outdoor area. What is more, the spotlight by Bega is equipped with an energy-efficient LED module, which only needs 12.9 watts to generate a luminous flux of 1630 lumens and thereby outperforms a 100 watts incandescent lamp. Moreover, the LED module is protected against overheating and has an impressively high durability of at least 50,000 hours. The scope of delivery includes a supply line with a safety plug for a flexible installation. According to the protection classification IP65, the 77326 LED spotlight with earth spike is dust tight and protected against water jets from any direction. The light temperature is neutral-white with 4000 Kelvins. Tell other customers and us about your experiences with the 77326 - LED Spotlight with Ground Spike ! 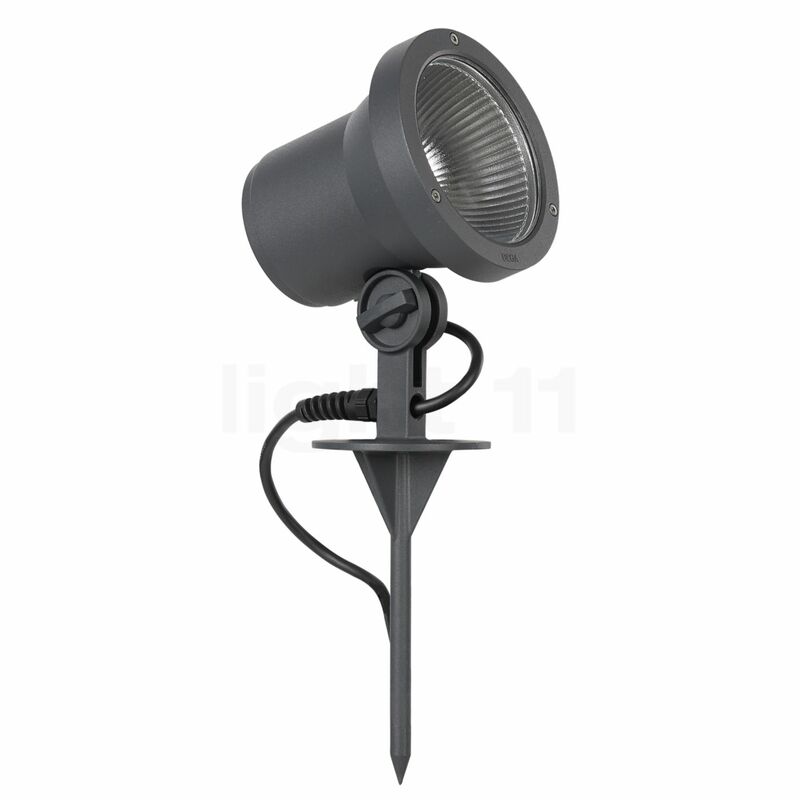 Thanks to the earth spike, the Bega 77326 LED spotlight can easily be stuck into a lawn, a flowerbed or another planting. The main advantage is that you may always move the luminaire to another place. In this way, you may accentuate trees and flowerbeds as well as shrubs, bushes or hedges. When placed near a terrace, a driveway or a house entrance, the 77326 LED spotlight with earth spike provides better orientation and thereby increases safety. Last but not least, the compact light source is also suited to mark a path or place in the garden.